Sinewy synths, ethereal vocals and electro rhythms meld seamlessly with lasers and cutting-edge lighting & data visualisation for this captivating world-premiere performance inspired by climate change and forced migration. Written and performed by Richard Evans, whose previous musical credits include work with James and indie chart-topping new wave act St Vitus Dancers, this inspiring show will be followed by an in-depth panel discussion with climate scientists, evolutionary biologists and immunologists about the show’s compelling, challenging and thought-provoking themes. Sentinel is part of the Aeon: Miracle smartphone app project. Join our scientists for a fun-filled day of challenges, experiments, and interactive demonstrations. Explore the science of bubbles, dance with robots, get hands-on with bugs, and fungi and land yourself some moon rock. 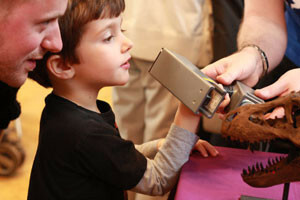 With more than 40 interactive science activities on offer, it really is an event for all the family. What’s more, you’ll also get to chat with the amazing scientists and engineers behind some of the world’s greatest discoveries. Scientific phenomena have never been quite so… explosive. Join Dr Frank Mair, a world-renowned chemist from the University of Manchester as he takes you on a whistle-stop tour of science and sound. Learn how waviness is the root of magnetism, why quantum physics is so badly behaved and just what it is that makes fireworks quite so fiery. You’ll leave us having discovered the very quantum of science. There’s an outbreak – a deadly contagion grips Arcadia Life Sciences, and members of the public are urgently needed to help scientists identify the carrier of the virus behind the pandemic. Welcome to Aeon: Patient X, an immersive theatre experience from the team behind Aeon: Live at MSF16. This event stars Paul Warriner (World’s End, Inspector George Gently) and Angela Costello (Churchill), blending real science, augmented reality and a smartphone app to show you all about the science of contagion. You’ll be guided through the event to uncover viral traces, working your way towards the source of the contagion: Patient X. If walls could talk…would a library have much to say? Find out for yourself at The John Rylands Library. The brainchild of electroacoustic composers David Berezan and Guillaume Dujat, hear the spaces around you come to life with sound, inspired and created by the building itself. Climb staircases through melodies of the sea, influenced by the library’s luminous lantern gallery. Hear the Library being ‘played’ in a multi-channel electromagnetic sound installation, designed by the ‘electrical veins’ of the library itself. The symphonies behind the tomes and the stones mean you’ll certainly never judge a book by its cover again. The space aces of Jodrell Bank present a live science show that’s out of this world. Learn how the on-site Lovell telescope has been pushing back the final frontier since the ’60s, tracking the Soviet rocket Sputnik 1 and monitoring the first manned space mission to the moon, Apollo 11. Take part in an interactive science show that’ll explore the history of space exploration, the present state of the space industry and the future of space travel, covering everything from unmanned orbital missions to reusable spacecraft and space tourism. Central Library is a mysterious, secret-filled place. Who knows what hidden knowledge lies between the pages of its many books? Read up on the spirit of scientific investigation and come find out for yourself, discovering how science has affected the story-lined corridors of Manchester Central Library over the centuries. Get elbow deep in moonrocks and meteorites, dig around in our archives, meet a real-life conservator, learn the fascinating history of science in the city and get hands-on with the collections (as well as some Lego robots) in the afternoon. Science’s sprightly toes are tapping with this dance and science masterclass, inspired by the Manchester Museum’s collections. This family event will show how science helps us understand what happens in the brain and body when we dance, and how dance can help us to move better, feel better and interact with others. There will be an opportunity to try out some dance moves, use your imagination, and even measure your own movement. Accompanying parents, guardians, grandparents and great grandparents welcome. As part of the Manchester Science Festival, The University of Manchester will be running its Spectacular Science event on Saturday 29 October, offering a fun-filled family day of science challenges, live experiments, and hands-on demonstrations to delight children and adults alike. Help us create a superhero, become a cell explorer, or build a world of fungus. Investigate our universe, make a mini robot dance, explore new wonder materials, and much, much more. 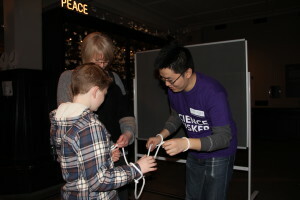 At the same time, our science buskers will be lining Oxford Road dishing out dazzling displays of scientific wizardry. So bring your mum and dad, your kids, and your friends to this free event. Manchester has a proud history of scientific discovery and by coming to the Science Spectacular you’ll be able to make some discoveries of your own! So come on down to the Manchester Museum for some Spectacular Science! Science Spectacular – a key event in the Manchester Science Festival programme, returns for 2016 and you are invited to take part. Now in it’s 6th year, our university-wide science fair invites families to explore interactive exhibits and take part in a diverse range of science and engineering challenges. This year we are also hosting Sampling Science talks – 3 researchers share a 30 minute space to share insights into their work. Props, images and objects are used to get the conversation started with the audience. (Download the Sampling Science Talks Proforma for more details). If you’d like to be a part of this award winning event, please complete the applicable pro forma by 9 September 2016. We hope you can join us at Science Spectacular 2015! 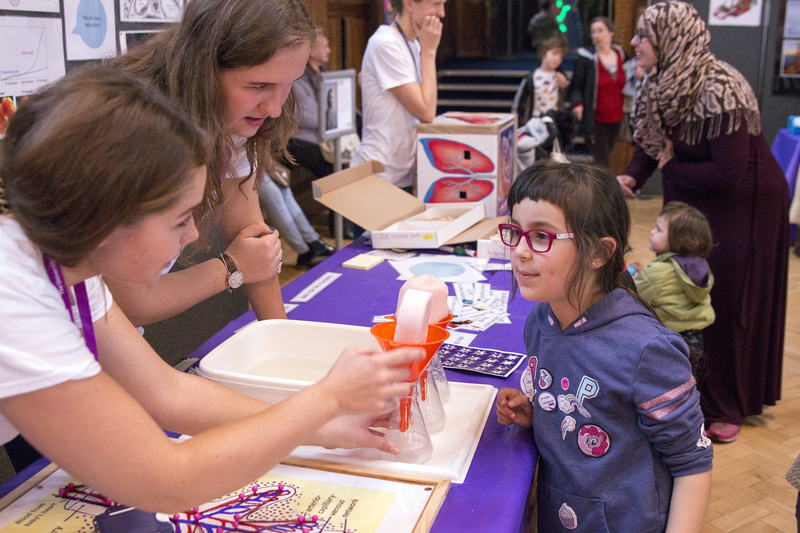 Hurrah the Manchester Science Festival is coming and The University of Manchester is playing host to our annual family science fun day Science Spectacular! Join our scientists for a fun filled day of science challenges, live experiments, and interactive demonstrations. There will be lots of activities suitable for children of all ages, including face painting and lucky science dips, and there’s plenty to keep adults entertained too! Help us create a mini tornado, snuggle up to some creepy crawlies, crack our secret DNA and computer codes, play the imitation brain game, explore science on a microchip, build a world of fungus, work with mini robots, and more! So bring your mum and dad, your kids, and your friends to this free event. Take part in our fun science challenges and become a Manchester Science Star! We hope to see you there! On your way see if you can spot our science buskers along Oxford Road! 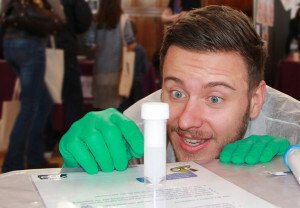 If you love science and engaging with the general public then we want to hear from you! Reliable and committed: If you are selected we will ask you to commit to 4 hours of science busking, from 11:00 – 15:00 on Saturday 31 October, on Oxford Road, Manchester. If you do decide that science busking is for you, you will be invited to attend a mentored practice at Manchester Museum on Tuesday 27 October. You’ll then have the opportunity to take part in the Science Spectacular on Saturday 31 October. Hurrah the Manchester Science Festival is coming and The University of Manchester is playing host to a Science Spectacular! With more than 40 interactive experiments and demonstrations you don’t want to miss out on our annual family science fun day. There will be lots of activities suitable for children of all ages, including face painting and lucky science dips, and there’s plenty to keep adults entertained too! Find out how to make square bubbles, help us build an erupting volcano, and see if you can put a fly in a headlock. You’ll also meet our newest dinosaur, Gorgosaurus, and discover why he has x-appeal! And don’t forget to have a chat to our scientists and engineers – they are behind some of the world’s most amazing discoveries. So bring your mum and dad, your kids, and your friends to this free event. Take part in our fun science challenges and become a Manchester Science Star! We hope to see you there! On your way see if you can spot our science buskers along Oxford Road! And if you’ve still got energy to burn, why not pop along to the Chemistry Flash Bang Show taking place 4-5pm, Chemistry Building, Brunswick Street. This event is part of Manchester Science Festival; Art and science collide to inspire curious minds of all ages at this eleven day Festival. Manchester Science Festival is proudly produced by the Museum of Science & Industry and supported by Siemens.